Chris Grayling has insisted he is not "shirking" his job by travelling to Qatar on the day the biggest rise in UK rail fares since 2013 came into effect. The transport secretary told the BBC he regrets the level of fare increase and wishes "it wasn't as high as it is". But he said he was "trying to win jobs for Britain" by going to the Gulf. 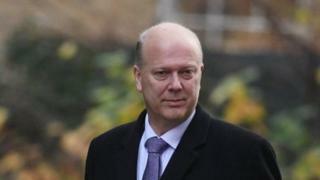 Labour said Mr Grayling had "gone into hiding" as protests took place at 40 stations against the fare rises. Many commuters have seen their season tickets go up by more than £100. The government has insisted Mr Grayling's trip to Qatar was "pre-planned", but it has been seized upon by opposition parties, who claim it shows his disregard for commuters. Speaking to Radio 5 Live from the Middle East, Mr Grayling - who is MP for Epsom and Ewell - said he cannot "unpick decades of arrangements within the rail industry". "It's not fair to say to tax payers who use the railways you have to pay the cost of running the network. All this is part of giving the passengers a better system," he said. "We have to give staff a pay rise. We want to see the industry come in to line with CPI, we can't guarantee there won't be a rise in fares." Train fares: Why are they still going up? He defended his absence from the UK and his decision to travel to the Gulf state on a two-day trade visit. "I make no apology for trying to win jobs for Britain," he said. In an earlier interview with LBC radio, he said: "This increase was announced a month ago, and I've done radio interviews about it and answered questions in the House of Commons, so I don't think I've shirked the issue." Downing Street said "we've known [the fare rises] were coming for a while" and a full response had been issued. But Labour's shadow transport secretary Andy McDonald said Mr Grayling had gone "into hiding" because he was "unable to defend" the fare hike, and was also "refusing to explain the £2bn taxpayer bailout of Virgin East Coast". "Passengers deserve better than this," he added. Mr McDonald said he had been forced to cancel plans to take part in a protest against the rail fare in Leeds after his train from London Kings Cross broke down. "If anything ever demonstrated just how broken this system is it's this today," he added. Mr Grayling's visit to Qatar will be followed by a day in Turkey. Asked about the purpose of the visit, the prime minister's official spokesman said: "There are ministers visiting a whole host of countries spreading the message that Britain is a very good place to invest and to do business in. Chris Grayling obviously plays an important part in that." A government spokesman said the way fares were calculated was "under review" and the transport department "carefully monitors how rail fares and average earnings change". Liberal Democrat leader Sir Vince Cable said: "Rail passengers are shivering on platforms angered by the biggest fare increase in years while Chris Grayling is off globetrotting. "It's very difficult to see what useful function he can perform in Qatar and Turkey that our excellent trade officials could not." Mick Cash, general secretary of the Rail, Maritime and Transport union, said passengers forking out more for train travel will "draw their own conclusions" from Mr Grayling's decision to take a "trip to the Qatari sunshine". Mr Grayling is one of a number of ministers mentioned in press speculation over the weekend about a possible cabinet reshuffle. Asked whether he would remain transport secretary for the foreseeable future, the PM's spokesman said: "Chris Grayling is working hard and doing a good job as transport secretary."